The American engineer Lemuel Cox erected a timber trestle bridge across the River Shannon at Portumna in 1795. This was one of seven similar bridges erected in Ireland by Cox. The Portumna Bridge was partially rebuilt in 1818 and replaced in 1834 by another timber structure incorporating an iron swivel bridge over the navigation channel on the Galway side of the river, and causeways forming the approaches to the bridge. This bridge was in turn replaced by the present structure, which was completed in 1911. The Shannon at this point consists of two channels divided by Hayes Island, the one on the North Tipperary side being about 260 ft wide, and that on the Galway side being about 240 ft wide. Each channel is spanned by three pairs of mild-steel plate girders (either 80 ft or 90 ft in length) resting on 9 ft diameter concrete-filled cast-iron cylinders. The width of the approach roadways and bridge is 30 ft. 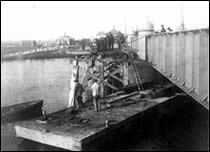 The swing bridge over the 40 ft wide navigation channel has unequal arms of 60 ft and 30 ft length respectively and revolves on a pivotal support on the Galway bank of the river. The river piers are continued upwards beyond parapet level, tapering to domed tops with decorated finials. The earlier substantial masonry abutments were retained when the replacement bridge was erected. The bridge was designed by C. E. Stanier of London to the specification of J. 0. Moynan, the County Surveyor of Tipperary (North Riding). The contractors were Hernan and Froude of the Newton Heath Ironworks in Manchester.